A collection of DIY and interesting stuff. I'm currently preparing our itinerary for our Hong Kong - Macau trip this year. Everything seems to go smoothly until I got to the day where we are supposed to have a day tour around Macau. Unlike Hong Kong, there's not MTR or anything like our good ol' MRT in Macau. I had the impression that getting around the area won't be as convenient since we have to rely on taking the bus or the cab. Of course, Macau has its advantages over Hong Kong in terms of savings on transport expenses with the presence of numerous free shuttle buses from major hotels and casinos in the peninsula. While taking the free shuttle buses may save money on fares, it can cost you your precious time especially if you just have one day alloted for you Macau trip. That means you would still get to take a cab or public bus. I have this eerie feeling about commuting while on a foreign land. I dread the idea of being on a bus then missing my stop or getting lost. Or worst, taking the wrong bus. I have a similar thing with commuting to an unfamiliar place here in the Philippines. For me, I'd rather walk and find my way into a particular place than get lost while aboard a jeep or bus. If I'm that scared of getting lost in my own city, what more in a land where not everyone understands English! Helpful members in various Macau forums I've joined were very encouraging that it's not that hard to commute around Macau, as long as you know which bus to take. They say there are signs indicating bus routes on the stops to help you but I need to familiarize myself on getting from one place to another in order to finish my itinerary. 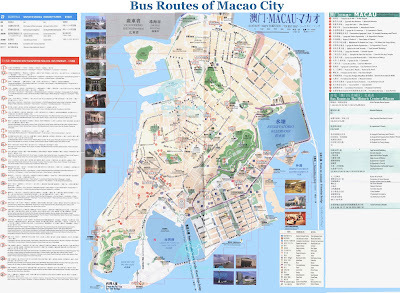 Searching for Macau bus routes in Google brought me to this very helpful map. I'm sharing this to those who plan to visit Macau in the future and plans to have a DIY trip as well. Enjoy making your Macau itinerary! meron bang lechon macau sa macau? Useful information. These will surely be a great help. Thanks! a quicκ shоut out and say I gеnuіnelу enjoу reaԁіng through your blog posts. Ϲan уou suggest any other blogs/websitеs/forums that dеal with the same tοpics? The Best Chicken Adobo Recipe Indeed!